Barred Owl - Main Road, Gill, Franklin Co., MA. November 24th, 2018. Finally a chance to catch up on some blog notes after a busy, but very lovely Thanksgiving Break. An adult Lesser Black-backed Gull showed up at Unity Park on the 21st and was present area in the Turner's Falls everyday after that. It looked very much like the returning winter adult that I've documented in Turner's Falls for at least the previous five winters. Lesser Black-backed Gull (adult) - Turner's Falls, Franklin Co., MA. November 21st, 2018. Lesser Black-backed Gull (right) - with Herring Gulls, Turner's Falls, Franklin Co., MA. November 21st, 2018. Lesser Black-backed Gull (center) - with Herring Gulls, Turner's Falls, Franklin Co., MA. November 24th, 2018. Iceland Gull (second-cycle) - Turner's Falls, Franklin Co., MA. November 21st, 2018. Great Black-backed Gulls (adults) - with a couple of Herring Gulls, Turner's Falls, Franklin Co., MA. November 21st, 2018. Waterbirds of note included a Common Loon at Turner's Falls Rod and Gun club throughout the period after initially arriving during the big waterbird fall-out on the 20th. The long staying female Surf Scoter was still present at Barton Cove on the 21st, a female American Wigeon was with Mallards at the Turner's Falls power canal on the 22nd and two Ruddy Ducks (first-winters) were at Barton Cove, Gill on the 26th. Perhaps more surprising was a late Double-crested Cormorant at Unity Park on 23rd, certainly one of the latest that that I've come across in Franklin County. The annual late autumn gathering of Hooded Mergansers at Barton Cove continued to be a feature but never really built up to the impressive show that we saw last year in late November with numbers remaining steady at around 65 birds for the area. Hooded Mergansers - Barton Cove, Gill, Franklin Co., MA. November 19th, 2018. Hooded Mergansers - Barton Cove, Gill, Franklin Co., MA. November 24th, 2018. Ruddy Ducks (first-winter) - Barton Cove, Gill, Franklin Co., MA. November 26th, 2018. Bufflehead - Turner's Falls, Franklin Co., MA. November 24th, 2018. Long staying, slightly injured female. Double-crested Cormorant - Turner's Falls, Franklin Co., MA. November 23rd, 2018. Some 1200 Canada Geese gathered at the Turner's Falls power canal on the 26th, the largest single concentration that I've seen this fall. The flock contained at least two Cackling Geese but unfortunately time constraints prevented me from finding a few more birds of interest though I would have loved to have stayed a bit longer! Cackling Goose (center) - Turner's Falls, Franklin Co., MA. November 26th, 2018. Cackling Goose (right) - Turner's Falls, Franklin Co., MA. November 26th, 2018. Cackling Goose (left) - Turner's Falls, Franklin Co., MA. November 26th, 2018. The wave of irruptive finches passing through northern Franklin County most certainly tapered during the Thanksgiving period with very few Purple Finches and Pine Siskins, though I did have a very vocal Evening Grosbeak on North Cross Road, Gill on 23rd. On the plus side, Snow Bunting numbers increased with up to 50 at Northfield Meadows (on the 26th), 7 at Turner's Falls Airfield (on the 26th) and 4 at Caldwell Road fields, Northfield on several dates where a Lapland Longspur joined a small flock of Horned Larks on the 22nd. Snow Buntings, Caldwell Road, Northfield, Franklin Co., MA. November 23rd, 2018. Lapland Longspur - Caldwell Road, Northfield, Franklin Co., MA. November 22nd, 2018. Snow Buntings - Northfield Meadows, Franklin Co., MA. November 26th, 2018. The passerine highlight of the period was arguably a very late Common Yellowthroat unearthed by Josh Layfield in Northfield Meadows on the 24th - I know of only one report later than that for Franklin County. Josh also had around 35 Snow Buntings in Northfield Meadows on the same day. Common Yellowthroat - Northfield Meadows, Franklin Co., MA. November 24th, 2018. Image appears courtesy of Josh Layfield. And, in keeping with other roadside reports from around northern Franklin County, I had a nice daytime encounter with a Barred Owl in Gill on the 24th. 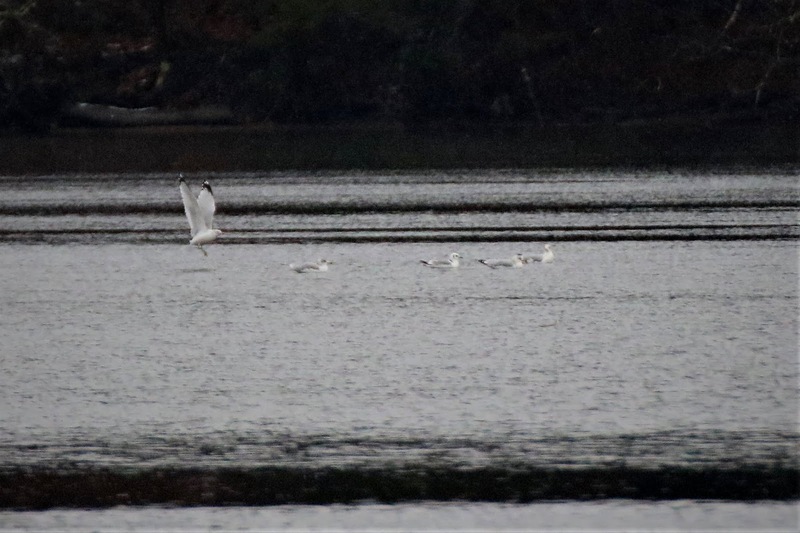 Black-legged Kittikwake (center) - first-cycle with Ring-billed Gulls, Turner's Falls Rod and Gun club, Franklin Co., MA. November 20th, 2018. Red-throated Loons - eight of nine present, Turner's Falls Rod and Gun club, Franklin Co., MA. November 20th, 2018. 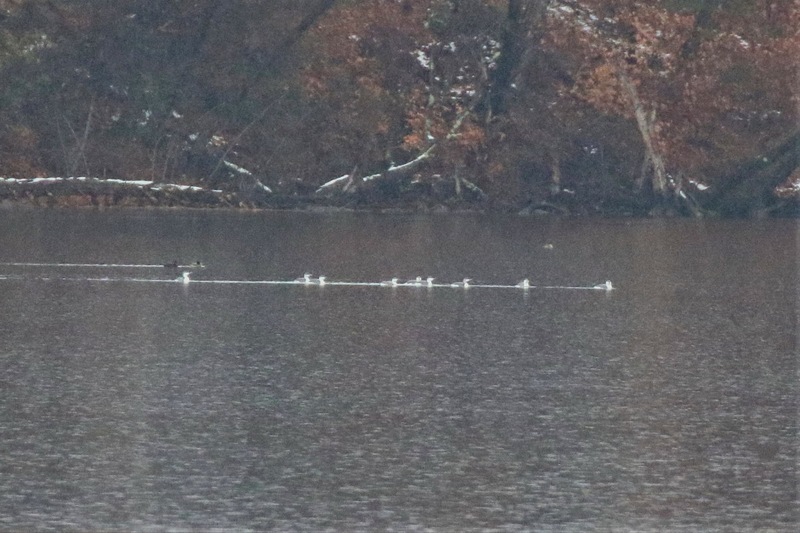 Red-throated Loons - all nine birds visible in this shot, Turner's Falls Rod and Gun club, Franklin Co., MA. November 20th, 2018. Red-throated Loons - all nine birds, Turner's Falls Rod and Gun club, Franklin Co., MA. November 20th, 2018. Black-legged Kittikwake - first-cycle with Ring-billed Gulls, Turner's Falls Rod and Gun club, Franklin Co., MA. November 20th, 2018. 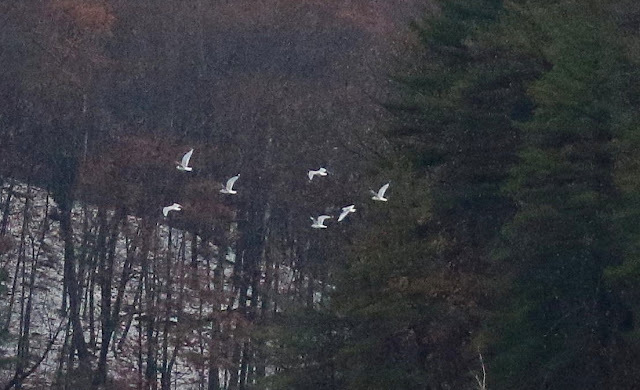 Black-legged Kittikwake (second from right) - first-cycle with Ring-billed Gulls, Turner's Falls Rod and Gun club, Franklin Co., MA. November 20th, 2018. Iceland Gull - second-cycle with Herring Gull, Turner's Falls, Franklin Co., MA. November 20th, 2018. Red-throated Loons - Barton Cove, Gill, Franklin Co., MA. November 20th, 2018. Distant records shots in a snowstorm. 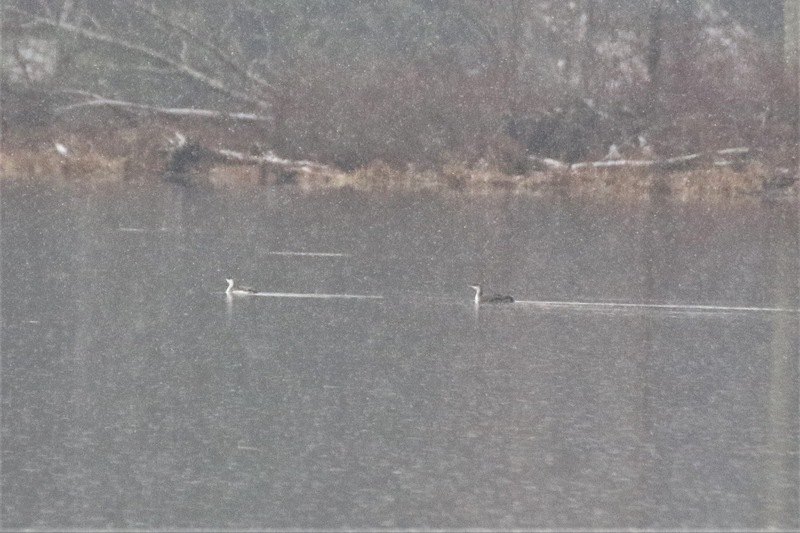 This morning, two of the loons were inside Barton Cove best viewed from the public boat ramp whilst the other two were at the Turner's Falls Rod and Gun where new birds included a Surf Scoter (first-winter male) and Lesser Scaup (first-winter male) and a juvenile Common Loon. A female Surf Scoter, 10 Ring-necked Ducks, 6 Common Goldeneye and around 65 Hooded Mergansers continued inside Barton Cove. Red-throated Loons - Barton Cove, Gill, Franklin Co., MA. November 20th, 2018. Distant digi-scoped shot. Red-throated Loons - Turner's Falls Rod and Club, Franklin Co., MA. November 20th, 2018. Distant records shots in heavy snow. Earlier I checked the Caldwell Road fields in Northfield but found just four Horned Larks and Savannah Sparrow by the roadside and it looks like the flock containing the longspurs has moved on. Noteworthy passerines elsewhere included an American Pipit at Barton Cove boat ramp, plus a Ruby-crowned Kinglet on Riverview Drive, Gill. Lapland Longspurs (3) - with a single Horned Lark, Caldwell Road, Northfield, Franklin Co., MA. November 18th, 2018. The first winter storm of the season came early and deposited a good six inches of wet snow around much of northern Franklin County. The weather event happened overnight and continued into Friday (11/16), canceling local schools and leaving me with limited time to explore as we rolled into the weekend. Unsure of what to expect, I poked around Northfield, Gill and Turner's Falls making the most of the incidental birding opportunities that came my way. Almost every stop was productive. Cackling Goose (top left) - Turner's Falls power canal, Franklin Co., MA. November 16th, 2018. Group arriving at dusk. Cackling Goose (center) - Turner's Falls power canal, Franklin Co., MA. November 17th, 2018. Friday (11/16) afternoon saw a newly arrived Cackling Goose and 20 Snow Buntings at the Turner's Falls power canal, while the Iceland Gull first seen on the previous evening was roosting at Unity Park. Saturday (11/17) was full of interest with three Lapland Longspurs in a flock of less than a dozen Horned Larks at Turner's Falls Airfield, a juvenile Common Loon at Turner's Falls Rod and Gun club, and a very handsome Bonaparte's Gull at Unity Park. Later in the day, a chance visit to Caldwell Road fields produced a Vesper Sparrow along with further two Lapland Longspurs with some 55 Horned Larks. In addition, the Cackling Goose from the previous day was still to be seen at the Turner's Falls power canal. Iceland Gull (second-cycle) - Unity Park, Turner's Falls, Franklin Co., MA. November 16th, 2018. This bird has been present daily around Turner's Falls through to the 18th. Bonaparte's Gull - Unity Park, Turner's Falls, Franklin Co., MA. November 17th, 2018. Lapland Longpsurs (3) - landing at Turner's Falls Airfield, Franklin Co., MA. November 17th, 2018. Lapland Longpsurs (3) - Turner's Falls Airfield, Franklin Co., MA. November 17th, 2018. Same three as shown above with two upper left of shot and one at extreme right. Horned Larks - Turner's Falls Airfield, Franklin Co., MA. November 17th, 2018. Common Loon (juvenile) - Turner's Falls Rod and Gun club, Franklin Co., MA. November 17th, 2018. Five Lapland Longspurs in Franklin County in a single day was quite unlike anything I'd seen before. Typically, I'm lucky to get one or two flyovers in late fall and early winter and that's usually it for the whole year. Moreover, these birds were on the ground foraging and I couldn't help but wonder if the unusually early snow cover had pushed them out of the fields where they'd normally be overlooked? Curiosity got the better of me and I returned to Caldwell Road fields for another look finding fewer Horned Larks but a whopping six Lapland Longspurs! The same flock attracted three Snow Buntings, an American Pipit and at least nine Savannah Sparrows. Lapland Longspurs (3) - with a single Horned Lark, Caldwell Road field, Northfield, Franklin Co., MA. November 18th, 2018. Surf Scoter (female) - Barton Cove, Gill, Franklin Co., MA. November 18th, 2018. Long staying individual present since Nov 6th. Other passerines of note over the weekend included flyover Evening Grosbeaks at Turner's Falls Airfield, North Cross Road and Caldwell Road fields, Ruby-crowned Kinglets at Unity Park on the 17th and North Cross Road on the 18th, and reasonable numbers of Fox Sparrows still in Northfield Meadows and Caldwell Road fields. Iceland Gull (L.g.kumlieni) - second-cycle, Turner's Falls power canal, Franklin Co., MA. November 15th, 2018. Opportunities for viewing gulls at Turner's Falls have been few and far between this autumn. The larger gulls in particular have been extremely scarce with very few (single digits) of both Great Black-backed and Herrings Gulls. But that finally changed this evening when I was delighted to find a small raft of both species, along with some Ring-billed Gulls, at the power canal. I hadn't been there too long when the next flock to arrive brought a lovely second-cycle Iceland Gull. Many of the gulls left before complete darkness but the Iceland Gull was one of the few that remained. In addition, there just happened to be a tremendous waterfowl roost this evening with some estimated 800 Canada Geese, 500 Mallard, 60 Common Merganser and 35 Common Goldeneye among the species present. Cackling Goose - Up to three at Turner's Falls power canal until Nov 4th. 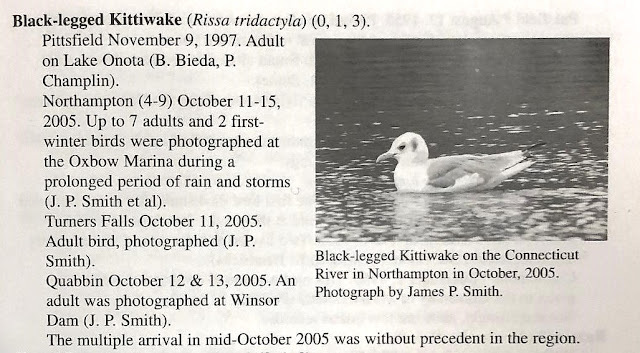 None confirmed after that until one flew downriver with Canada Geese at Montague on the 14th (Brian Kane). Green-winged Teals - Montague, Franklin Co., MA. November 13th, 2018. Green-winged Teal - an impressive flock of 22 on Meadow Road, Montague on the 10th. (Brian Kane), with 14 still present on the 13th. Ring-necked Ducks - Turner's Falls power canal, Franklin Co., MA. November 9th, 2018. Ring-necked Duck - singles and pairs in the Turner's Falls area regularly including 8 together at Barton Cove, Gill on the 12th, and 10 there on the 13th. Lesser Scaup - one (male) at Turner's Falls Rod and Gun club on the 5th. Black Scoter (right) - female with female Surf Scoter, Barton Cove, Gill, Franklin Co., MA. November 6th, 2018. Black Scoter - one (female) at Barton Cove, Gill on the 6th and 7th. Surf Scoter (right) - female with Ring-necked Duck, Barton Cove, Gill, Franklin Co., MA. November 12th, 2018. Surf Scoter - one (female) at Barton Cove from the 6th - 14th. Common Goldeneyes (with Buffleheads) - Turner's Falls power canal, Franklin Co., MA. November 3rd, 2018. Common Goldeneye - a notable arrival on the 3rd with 19 at Turner's Falls power canal alone, then daily after that with approxiamtely 30 in the area between the Rod and Gun club, Barton Cove, and the power canal. Ruddy Duck - male in the mist/drizzle, Barton Cove, Gill Franklin Co., MA. November 2nd, 2018. Ruddy Duck - one (male) at Barton Cove, Gill on the 2nd. Red-breasted Merganser - one (female/imm) at Barton Cove, Gill on the 13th. Turkey Vultures (9) - SW over Turner's Falls Airfield, Franklin Co., MA. November 10th, 2018. Turkey Vulture - a few singles in Northfield early in the month but a general departure from the area from the 5th, but a single flock of 9 migrated SW over Turner's Falls Airfield on the 10th. A single bird over West Gill Road on the 14th. Black Vulture - 3 seen from Turner's Falls Airfield on the 10th but distant and over the Gill side of the CT River. Almost certainly the same 3 seen two hours later low over Main Road Gill at Upinngil Farm. Red-shouldered Hawk - 1 (adult) migrating SW over Turner's Falls Airfield on the 11th. Peregrine - 2 (adults) at Turner's Falls Airfield on the 11th and 12th. Common Gallinule - 1 (immature) continued at Tri-town Beach, Whately through to the 9th, usually in company with a single American Coot. Greater Yellowlegs - Meadow Road, Montague, Franklin Co., MA. November 10th, 2018. Greater Yellowlegs - 1 at Meadow Road, Montague on the 10th and 14th but aloof at other times (Brian Kane). Gray Catbird - Northfield Meadows, Franklin Co., MA. November 9th, 2018. Gray Catbird - one at Northfield Meadows on the 9th. Northern Shrike - South Ferry Road, Montague, Franklin Co., MA. November 5th, 2018. Northern Shrike - 1 at South Ferry Road, Montague on the 5th. Tree Swallow - adult male, Turner's Falls power canal, Franklin Co., MA. November 11th, 2018. Tree Swallow - 1 (male) moving south over Turner's Falls power canal in late afternoon on the 11th. My personal latest by over a month and quite possibly the first November record for Franklin County. Winter Wren - singles (up to 3) along North Cross Road, Gill on several dates but not consistent. Also one in Northfield Meadows on the 9th. Snow Bunting - South Ferry Road, Montague, Franklin Co., MA. November 5th, 2018. Snow Bunting - mostly scattered singles and pairs at sites such at Turner's Falls Airfield and Northfield Meadows but 3 together on South Ferry Road, Montague on the 5th and 16 migrating south over Northfield Meadows on the 9th. Horned Lark - numbers increasing after a slow start to the fall with 65 south over Northfield Meadows on the 9th, and 12 west over Turner's Falls Airfield on the 10th. Palm Warbler - singles regularly in Gill, Northfield and Montague through to the 9th. Yellow-rumped Warbler - up to 15 regularly at Northfield Meadows through to the 9th and a single a Turner's Falls Rod and Gun club on the 13th. American Tree Sparrow - Northfield Meadows, Franklin Co., MA. November 4th, 2018. American Tree Sparrow - mostly singles in the early part of the month but small flocks becoming more widespread from the 13th, for example 10 on North Cross Road, Gill on the 14th. Field Sparrow - up to 2 regularly at Northfield Meadows through to the 10th. Vesper Sparrow - Northfield Meadows, Franklin Co., MA. November 2nd, 2018. Vesper Sparrow - at least 1 in Northfield Meadows on the 2nd. Fox Sparrow - daily in Northfield Meadows through to the 12th with relatively high numbers including 12+ over the 8th and 9th. White-crowned Sparrow - daily in Northfield Meadows through to the 12th with up to 6 there early in the month. Rusty Blackbird - 3 on North Cross Road, Gill on the 8th and 1 in Nortfield Meadows on the 9th. Common Grackles - Northfield Meadows, Franklin Co., MA. November 2nd, 2018. Common Grackle - an impressive flock of aroun 6,000 in Northfield Meadows on the 2nd. Red Crossbill - two singles in Montague; 1 east over South Ferry Road on the 5th, and another calling in Montague Plains on the 15th. Both sounded most like Type 1. Evening Grosbeak - scattered singles flying over sites such as Nortfield Meadows, North Cross Road, Gill and Turner's Falls Airfield but 10 west over North Cross Road on the 5th. Purple Finch - continued presence at many sites, daily in Northfield and Gill. Pine Siskin - daily with small flocks flying over many sites including 35 SW in one hour at Turner's Falls Airfield on the 7th.